Our Allgäuer Berghof in Bavaria is not just a family and children's hotel. It is also one of the best baby hotels in Bavaria and whole Germany. Look forward to a relaxing baby break with time for wellness during your Allgäu vacation. Whether in the winter on a skiing holiday with your baby or in summer on a relaxing hiking holiday with the whole family: here your family holiday is sure to be the highlight of the year. Our hotel rooms are specially designed for families, so you never have to worry about your baby. In the Allgäu we have thought of everything for your holiday: from baby spa and baby monitor to the changing mat, here you will have everything you need. In our family-friendly hotel, there are many opportunities for playing, which also do not stop at the meal: In our children's restaurant we offer a varied baby buffet with the best organic products, breastfeeding tea and baby formula. In the Allgäuer Berghof, your baby holiday will be special. Everyone who says that wellness with children is not possible, should immediately book his vacation in our hotel, because we not only have a large spa for mum and dad, which promises a lot of rest, but also babies can splash around happily in our specially designed pool for toddlers. Let yourself be pampered while you know your sweetheart in Bavaria's popular baby hotel in the Allgäu in the baby care in the best hands. Enjoy together during your vacation our wellness and leisure offers. Experienced supervisors and baby experts take care of your offspring up to 42 hours per week with a lot of heart. Also in the evening from 6 to 8 pm we look after the smallest guests during their vacation in our baby hotel in Bavaria in the Allgäu. So you can calmly use the spa or enjoy our delicious dinner buffet. Baby hearts beat faster with us in one of the most popular baby hotels in Bavaria and whole Germany. During your holiday in the Allgäu in our hotel in Bavaria, you will experience baby wellness, equipment perfectly tailored to children and our "anytime room" which is open for free playing all day. Also take a look at our large indoor game variety. We offer you loving child care in the "Zwergerlreich". Especially for the youngest ones from 0 years old until they can walk, we have lovingly decorated this room with everything that makes a baby's heart beat faster. Even the smallest ones have their own toddler playground right in front of the doors of the new, light-flooded Zwergerlreich, on which it is easy to play safely. In the outdoor area of the Allgäu Berghof you will find our other playgrounds and the petting zoo. Spend wonderful days with your family and get to know nature and animals together. Parents can keep an eye on their little sweethearts right from the sun terrace, when they are having fun on the swing or play in the sand. Large sunshades provide shadow in the summer. All this makes our hotel one of the most popular baby hotels in Bavaria and throughout Germany. Are you looking for a hotel in the Allgäu with child care for your skiing holiday? Then you are exactly right with us! Enjoy your holiday including wellness offer with your baby in the Allgäu and ski right next to the hotel. Your benefits: your kids 7 years old are free in parents room. In our family hotel in the Allgäu we guarantee fun and relaxation for the entire family. A wide range of facilities for young and old offers unforgettable days. For your perfect holiday in the Allgäu. We enlarged our hotel for you: Discover the new features of our family and wellness hotel which we have cultivated and converted for you during the last months and get some first impressions. In our family hotel in Bavaria there is wide range of rooms avaiIable. With the lovely decorated rooms, family apartments, suites and chalets, there is a suitable accommodation for everyone. Our regionally rooted hotel combines traditional values with modern comfort for your family holiday in the Allgäu. Enjoy the great program and familiar atmosphere. We provide you a wonderful family holiday in the Allgäu. 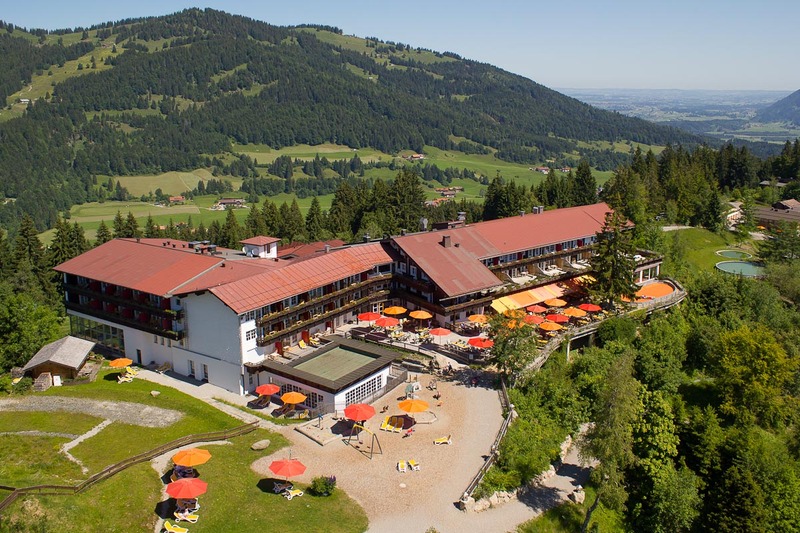 For your perfect family holiday in the Allgäu: we constantly test and improve the quality on the Berghof, so that we can guarantee you excellent quality in our family-friendly hotel. As family-friendly hotel, we do our best to let you experience the perfect holiday with your family. That's why everything which could make travelling more easy for you, is available at the Allgäuer Berghof - from buggy to baby food. With us you can spend a perfect holiday with child care. Your kids can be creative, play are just take a nap under loving supervision. Experience a stress-free holiday with child care.